A white index card containing the name, rank and military history of a soldier of Waterloo County. Card also includes a photograph and a red cross. 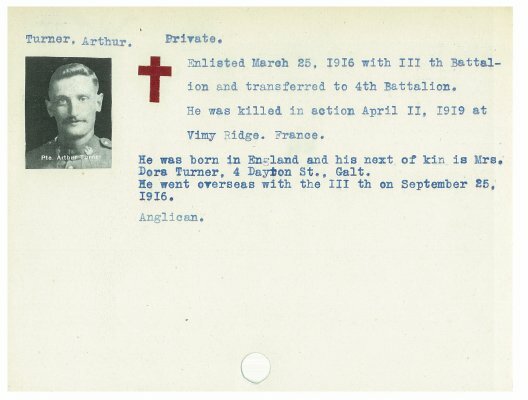 Private Arthur Turner was born on August 25, 1890 in Byfleet, Surrey, England. His wife was Dora Turner. They were married in Galt on November 13, 1915. He enlisted on March 25, 1916 in Galt with the 111th Battalion. At the time of his enlistment, he was a labourer, married and a member of the Church of England. His residence was 4 Dayton Street, Galt, Ontario. His regimental service number was 730672. He served with the 4th Battalion, Canadian Infantry. He was killed in action during the Battle of Vimy Ridge on April 11, 1917. He is buried in the Bois-Carre British Cemetery in Thelus, France. Enlisted March 25, 1916 with 111th Battalion and transferred to the 4th Battalion. He was killed in action April 11, 1919 at Vimy Ridge, France. He was born in England and his next of kin is Mrs. Dora Turner, 4 Dayton Street, Galt. He went overseas with the 111th on September 25, 1916.